The Concise Encyclopedia of Language and Religion provides the specialist and the general reader with accurate, up-to-date information on every aspect of the crucial interface between language and religion. Easy access to material in over 320 articles by scholars in many fields is provided both in a clear thematic arrangement, and by means of a comprehensive and detailed general index. Discussion of many topics including the creation of special sacred scripts, religious calligraphy, and the use of religious symbols in meditation, magic and elsewhere, is enriched and elucidated by illustrations, diagrams and tables. 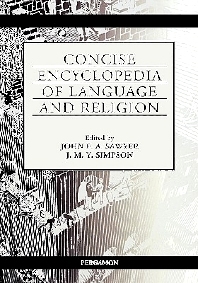 The Concise Encyclopedia of Language and Religion brings together articles and bibliographic entries drawn from the award-winning Encyclopedia of Language and Linguistics, all of which have been revised and updated appropriately. These articles are supplemented by a large number of completely new contributions, one of which is an extensive 12,500 word article on 'Basic Concepts and Terms in Linguistics', making this volume accessible to a wide audience. For academic researchers, teachers, graduate and postgraduate students in the disciplines of religious studies, theology, linguistic history and sociology.